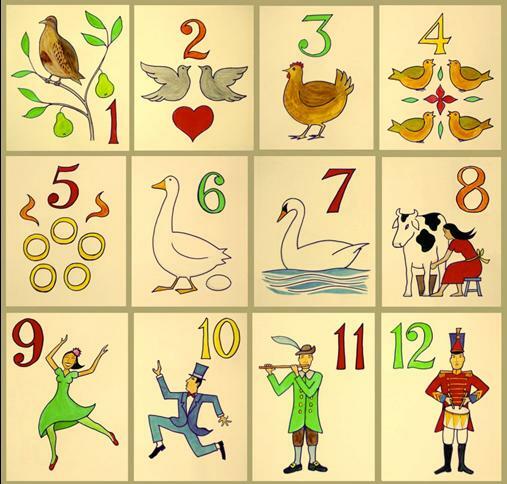 On the First Day of Christmas (Dec 13) my true love gave to me a Partridge in a Pear Tree! So you add a photo of a partridge on the note and give them One Pear. On the Second Day of Christmas (Dec 14) my true love gave to me 2 turtle doves! So you give them 2 Dove Ice Cream Bars … of course they will share the second one with you! On the Third Day of Christmas (Dec 15) my true love gave to me 3 French hens. So give them 3 Cadbury Eggs or 3 Fresh Eggs after all Hens lay eggs RIGHT! On the Fourth Day of Christmas (Dec 16) my true love gave to me 4 calling birds! So give them 4 Toy Cell Phones with candy in them and add Photo of Birds! On the Fifth Day of Christmas (Dec 17) my true love gave to me 5 golden Rings! So give them 5 Ring Pops and wrap in gold colored paper! On the Sixth Day of Christmas (Dec 18) my true love gave to me 6 geese a-laying! So give them 6 Chocolate Covered Strawberries in an Egg Carton since the geese already Laid their eggs! On the Seventh Day of Christmas (Dec 19) my true love gave to me 7 swans a-swimming! So give them 7 small packages of Bubble Bath and 7 small packages of Goldfish Crackers! On the Eighth Day of Christmas (Dec 20) my true love gave to me 8 maids a milking! So give them 8 single servings of Chocolate Milk! On the Ninth Day of Christmas (Dec 21) my true love gave to me 9 ladies dancing! So give them 9 Pirouette Chocolate Treats and Photo of Dancing Shoes and make them go dancing with you this very night! On the Tenth Day of Christmas (Dec 22) my true love gave to me 10 lords a leaping! So give them 10 gummy frog candies or 10 of any type frogs even if it is photos on paper! On the Eleventh Day of Christmas (Dec 23) my true love gave to me 11 pipers piping! So give them 11 piping Hot Chocolate with Marshmallows! On the Twelfth Day of Christmas (Dec 24) my true love gave to me 12 drummers drumming! So give them 12 individual Ice Cream Drumsticks or for my Son Nate I would give him 12 real drumsticks to use! What are your ideas to make this better I would love to have input and thanks for taking time this Holiday Season to enjoy this silly blog!